During one of their many conversations, Landshark and Bubba decided to do something to help their fellow animals. They asked Mom and Dad for advice, and founded Landshark and Bubba's Coffee. 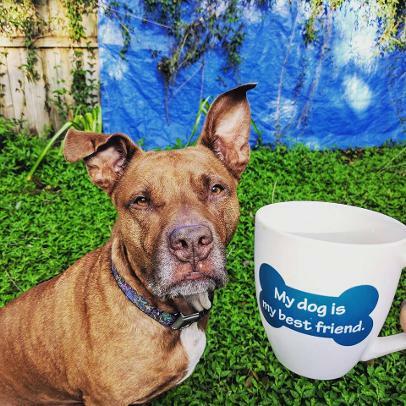 Together with their humans, and an award winning coffee roaster near Seattle, Landshark and Bubba are providing premium quality specialty coffee, and giving 30% to animal shelters and rescues across The United States! And as a welcome to the family, they are donating 50% of every bag for the next two weeks. That means, just for trying a this awesome coffee, you can save lives! Kelis adores her morning cup of coffee...she only gets a sip. Bubba had his own experience with being a shelter animal. 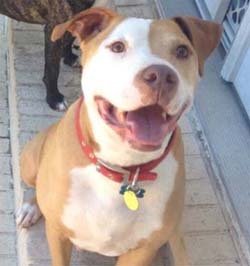 He was purchased as a puppy in California when he was eight weeks old. After a wonderful 2 ½ years living amongst his new family, he suddenly got an uneasy feeling one night while the parents were watching a television news program. As he lay there on the rug in front of the tv, snuggling with his family, he heard the warning. It seemed the news media had decided he was dangerous because of his breed. He looked at the family around him and saw the look in the parents eyes. Suddenly it didn't matter that he had spent 2.5 years being a good boy, loving, playing, and romping around with their kitty Fred, nope they were afraid of him. The parents pushed him into the back yard. He cried all night long wondering why. In the morning, the neighbor came, took Bubba into his car, and dropped him at a big cement building where he was fed, and given a tiny room with a little bed. Bubba was lonely, but he was safe. After what seemed like a very long time, the right human came in and took him home. That was many years ago, and he was thinking about it the day he met Landshark. Bubba and his furever family moved across country. His humans would visit the local animal shelter once in a while to see the animals and talk to the other people. 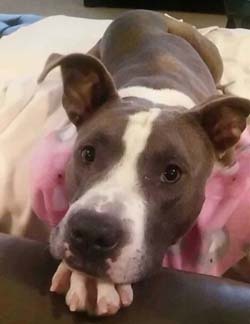 One day while hanging out, Bubba's people met a small muscular Pitbull who was just out of surgery. His right leg was amputated by the amazing Dr who works at the shelter. It seems this particular guy had been shot and left on the street. Bubba's humans filled out the paperwork and took this guy home. His name is Landshark and he and Bubba are the bestest of friends.